We have a great selection of 5ft divan beds with various storage options including 2 drawers, 4 drawers and continental drawers or build you own from our selection of divan bases that can be customised to your own requirements in our Divan Bases and Ottoman sections. 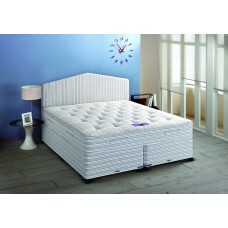 13.5g open coil sprung mattress with MEMORY FOAM upholstery and soft touch cover. 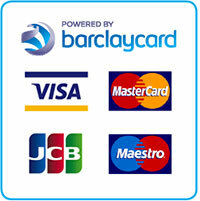 Medium Feel mattre.. Medium firm sleep with a 13.5 gauge open coil bonnell spring unit with rod frame, generous ..
13.5g open coil sprung mattress with a damask fabric cover. Medium Feel mattressTurnable ..
Hand Tufted Mattress with a 12.5g spring unit. Key Feat..
12.5 gauge Orthopaedic spring unit supported by rod edge periphery frame, Multiple layers o..
25mm of memory foam on open coil spring. Health Guard knitted fabric. 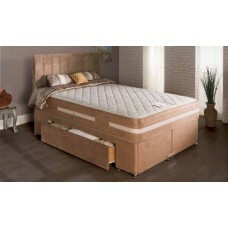 Air flow border, faux..
An incredible bed for the price with all the benefits of a more expensive model a a crazy pr..
Open Coil spring unit with rodge edge frame, memory foam, air flow mattress stitched with a..
Multi layered Mattress with a 12.5g spring unit.Key Features: An Orthopaedic bonne.. The Ortho Collection from Airsprung is designed for those who prefer – or require – a firmer le.. The Ortho Collection from Airsprung is designed for those who prefer – or require – a firmer level .. The Melinda from Airsprung is designed for those who prefer a bed with a slightly softer feel. It f..